In this post I will be going over my typical trading day from the night before, to premarket, and to market close. I will discuss how I use the bond futures, the VIX, NYSE advance/decline line, NYSE tick, and block trades as a way to trade in conjuction with my volume based market profiling. I look for short trade signals more so when price is above VAH(Value Area High), and I look to go long when the long signal is below VAL(Value Area Low). When trade entries are made with regard to volume profile on a range day, profit targets should be set to the POC, VWAP, or an exit based on a tick extreme. 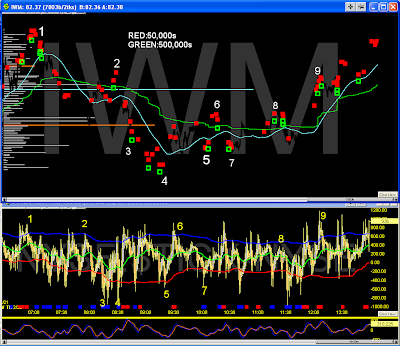 Entry points are based around block trades seen in IWM and SPY, with the prefered entry made at a tick extreme. When trade entries are made with regard to volume profile on a breakout day then I look to exit when there is heavy volume at a tick extreme. What happened yesterday? Did we have a breakout trend day or a range bound day? If the previous day was a bullish breakout day, then I would have a bias to take trades based off my trading method that would be buying VAL and vice versa if the previous day was a bearish trend day. If the previous day was a range bound day, then I would be looking to short VAH and buying VAL normally; however I will also be looking for breakout trend days driven by catalysts such as economic news and in some cases breakouts based on technical analysis like having a 3-7 day narrow trading range(NR3-7). 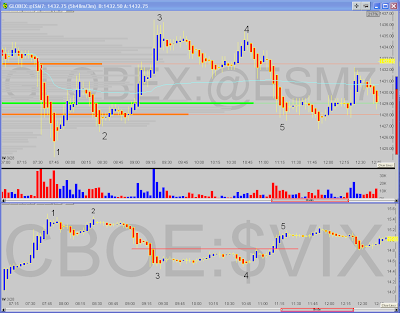 Below is an example of how I charted my volume market profile forecast for the next day. Also in my research the night before I like to look at the daily, weekly, and monthly volume profile for the markets I follow by going to Chart-ex.com. By checking out the volume profile on a weekly and monthly chart, you can see volume gaps; which are areas that I typically expect to be filled. 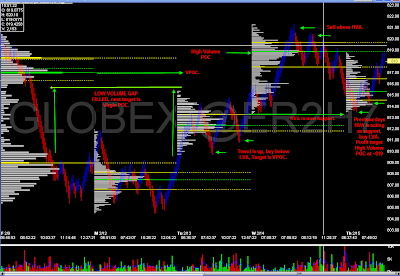 Here is an example of the volume profile charts from chart-ex on ER2 taken February 23, 2007. 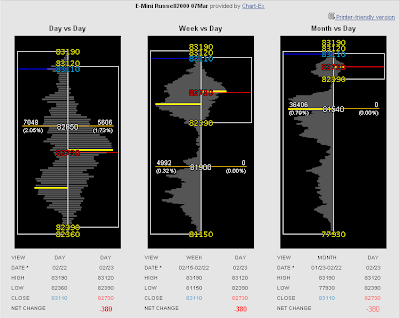 In the chart you can see price is trading at VAH on the weekly and monthly time frame, with a volume gap to the downside. are good as well for tracking US specific pending news. Market open: Is there a gap up/down at market open, and if so, why? Most of the time the gaps in the morning are due to economic news being released before the morning bell around 8:30am EST. Most traders know that morning gaps are good trading opportunities because they have a high probability of being filled or at least partially filled within the first hour of trading. 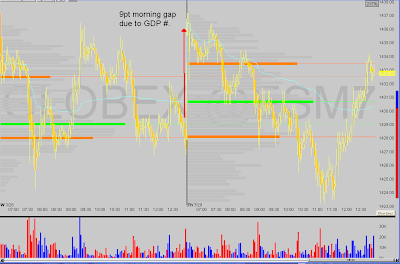 Here is an example from March 29, 2007 of a morning gap due to the GDP # being released before premarket, with the result of a 9pt gap on ES being filled with the first 2 hours of trading. 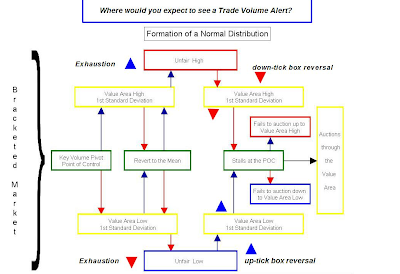 I will now discuss how I use the bond futures, the VIX, NYSE advance/decline line, NYSE TICK, and block trades as a way to trade in conjuction with my volume based market profiling. Starting during premarket of the stock market I track ZN, which is the most heavily traded bond futures contract(I also track ZF and ZB contracts as well). 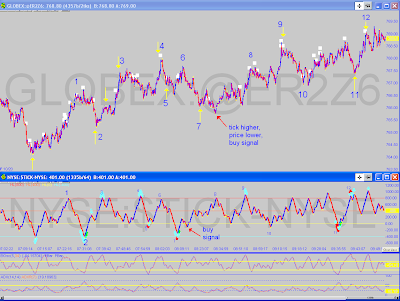 When watching ZN I look to see if there is heavy volume being traded and if there are any correlations or inverse correlations between ZN and ES. 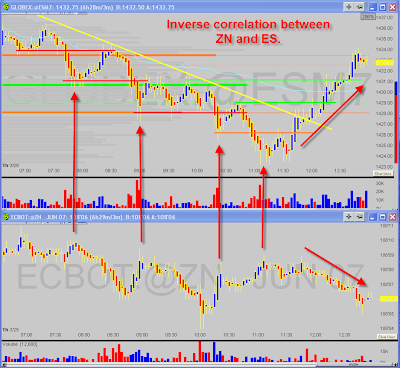 Some days you can see an inverse relationship between ZN and ES and other days you will see no relationship at all. The relationship between ZN and ES is a more advanced trading method that should be used in conjunction with other intraday market breadth indicators as a way to help confirm your trading signals. 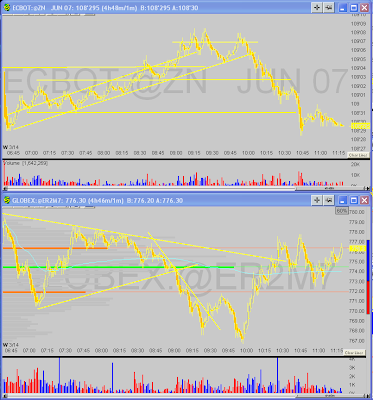 Here are some examples of the inverse relationship seen between the bond futures and ES, ER2, and SPY. 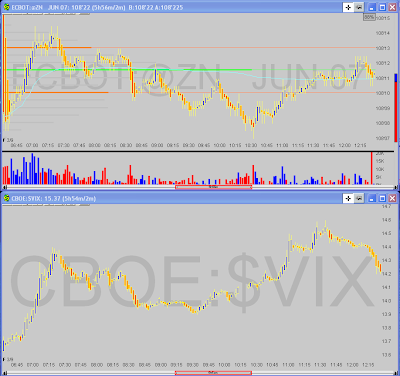 Sometimes you can see a positive correlation between ZN and the VIX, seen more so during the first 2 hours of trading. Here's an example. 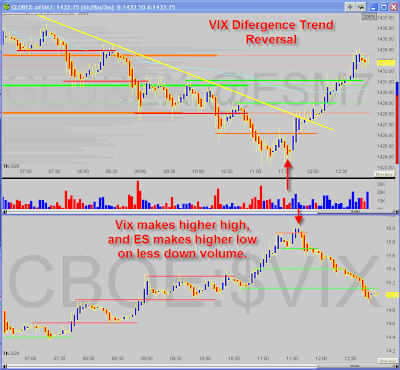 Sometimes you can see divergences between ES and the VIX. Here are some chart examples. By watching the NYSE A/D chart you can stay on the right side of the trend and see where possible breakouts in volatility may be placed. 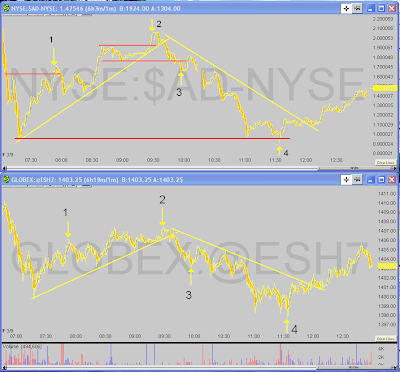 Here are some chart examples compared with ES and SPY. The NYSE TICK is one of the best intraday market breadth indicators for gauging short term price movements as noted by the NYSE TICK expert Dr. Brett Steenbarger. Some of Dr. Steenbargers articles on trading with the NYSE TICK can be found at Traderfeed. 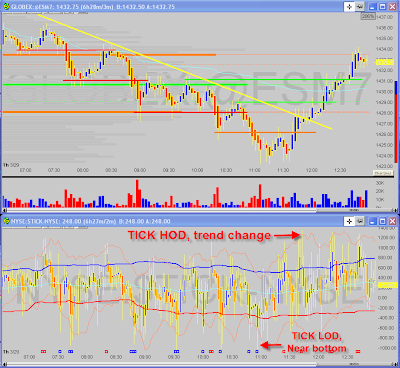 Here are some of my chart examples using NYSE TICK. 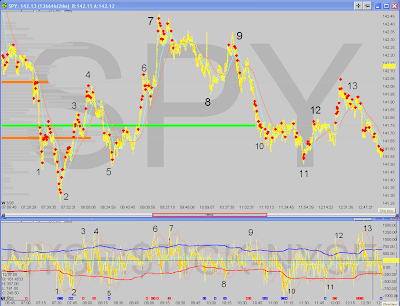 This tick chart of SPY highlights block trades as red dots compared to NYSE TICK. 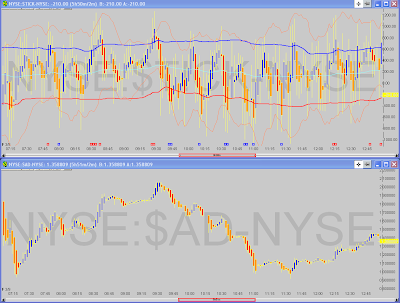 Here is an example of NYSE TICK compared to NYSE A/D. I filter for block trades(50-200,00 shares) on the ETF's of the underlying stock indices as a way to track large traders. I particularly look for these block trades around NYSE TICK extremes as signals for short term scalping opportunities and places to exit if I'm already in a trade. I do this because I don't have software like marketdelta, and I like looking for large volume trades in the ETF's because these block trades are seen as better signals when compared to ES and ER2 block trades. 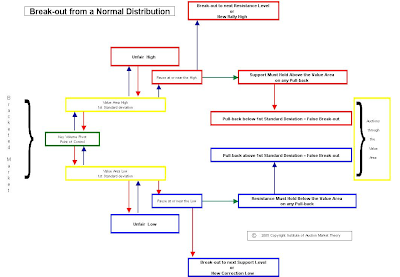 Here is a great article from Traderfeed on Tracking Large Traders. 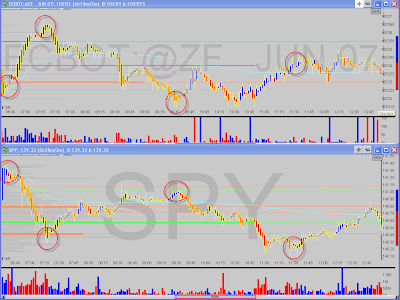 Here are some chart examples showing block trades highlighted as red and green dots on the ETF's I follow. 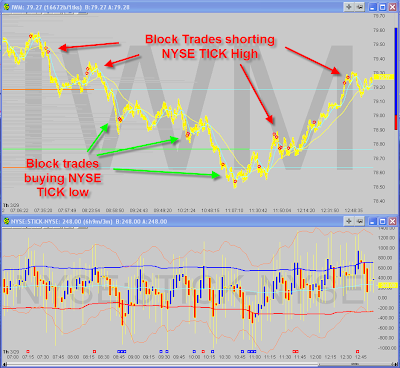 Here is a chart of ER2, NYSE TICK, and IWM showing block trades near NYSE TICK extremes. 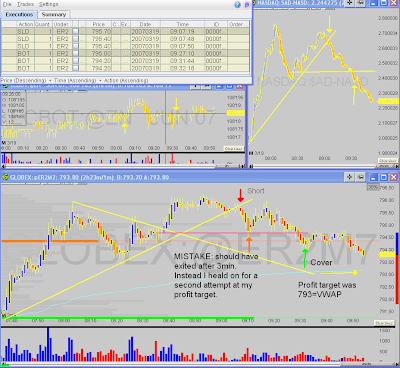 Here are a couple of my trading days taken from my journal that show my trade executions posted above the chart. 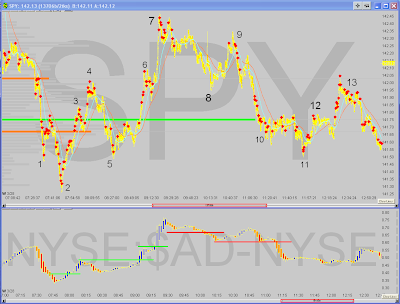 Here is an example of one of my trading days where I used a tick chart of SPY showing block trades for guidance in trading ER2 and YM. I looked for short signals because we were trading near VAH and there was no sign of a catalyst to turn the day into a breakout trend day. On this day I saw a double top on NASDAQ A/D and NYSE A/D, with the NASDAQ A/D line being the more bearish of the 2 charts. Also we were trading in the VAH, so based on my volume profile trading methodology I used this as a way to confirm my short trade signal. Thanks so much for taking the time to post how you trade. I have found your blog very valuable. Recently, I started using the A/D chart like you do and has helped me out tremendously. You're my favorite blogger now. Thank you very much for this insightful post! It looks useful too! Could I ask you a technical question? It looks like you are using QT with IB datafeed. Is this so? If not, which data feed do you use? I spoke with IB support but they are clueless. Thanks, I appreciate the support. I'm learning and gaining experience 1 day at a time. I use QT as well and love it. The NYSE A/D data most be collected in real time through IB. It can't be backfilled through IB. Also the vix, nyse volume, and other market internals for the other exchanges most be collected in real time as well by having these symbols in your QT portfolio or by having the charts open. Thank you very much for your prompt reply. I am collecting The NYSE A/D data in real time through IB. I am also the vix, Trin, tick, NYSE volume, and other market internals for the other exchange in real time. I only have this problem with the A/D and the VOL. I've been corresponding with IB support for several months regarding this. They are not very knowledgeable, to put it mildly. May I ask you, what area you are located in and if you are able to chart the A/D using the TWS? I'd really appreciate it. Thanks again. 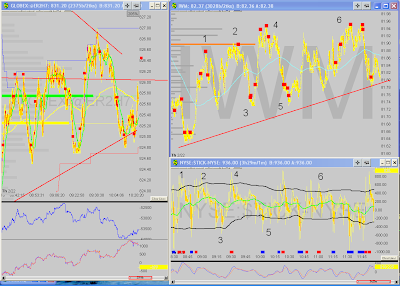 I believe you can chart Nyse a/d with TWS but you have to have the chart open. The data will be lost when you close TWS though. Personally I don't use NYSE volume or trin because they have never given me any edge and look more like noise to me. I do watch Nasdaq a/d, tick, and amex tick. 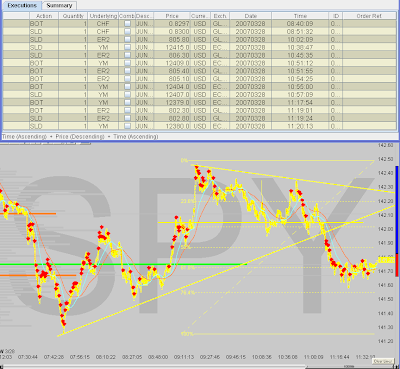 Checkout my new post on my chart setup for details. I live in Northern california. Thanks again. The reason I asked is because I don't receive any data whatsoever for the A/D. I wanted to compare with another QT+IB user. BTW, I've read your post a few times already, each time I get more impressed! This is a very insightful post, thanks for sharing the details. Can you explain more on the bonds-equity relationship? What should be the "normal" relationship? Or refer me to resources that talk about such intermarket links? Awesome post, thanks so much for sharing! X: Bonds and Equities have a inverse relationship, much like Yen and SPY. Bonds and equities because when investors perceive less risk they go with SPY and more risk they shun SPY and go for bonds. LP- How do you calculate/find the ETF block trades? If you ever have time, could you go into more detail of volume gaps on a post. I have some questions. How big of a role does the lack of volume play in volume gaps in pulling price to it? In other words, the less volume and/or larger the size of a gap, the stronger the pull? Would targets for shorts be the bottom of a volume gap, and the top of a gap be a target for longs? Yaser gave you a good answer on the bond to equities relationship. As for block trade signals I will address that in my next post. What charting software are you using? I use to use QT and IB data but the data from IB is not very accurate. I did inquier regarding their data and was told that they send their data every 1 second not tick by tick. I switched to Maketdelta and DTn IQ feed and even though it cost me $250.00 a month my trading is lot more profitable. I took a course through tradingeducationexchange.com cost $1300 but well worth the money. I have been trading last 2 years and was loosing money till I took the course and swithced my charting program and data provider. H, you are the shiznit. Nice post, just one question though - on the two example charts of ER2 and YM with TICK, the TICK looks unusual - is that a heiken ashi chart of TICK? What is the timeframe of the chart? 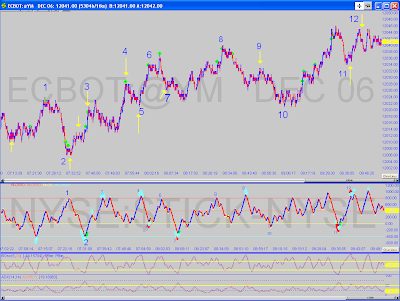 Yes, its a heiken ashi chart on a 2 tick time frame. I am trying to adjust to market profile based trading as I see how much it would have saved me during this crazy market run up which I have tried to fight too much. It looks like you tend to fade moves outside the value area - I was under the impression that those moves indicate an unbalanced market which would be given the benefit of the doubt until they get rejected (confirmation by moving back into the value area.) Am I way off base?